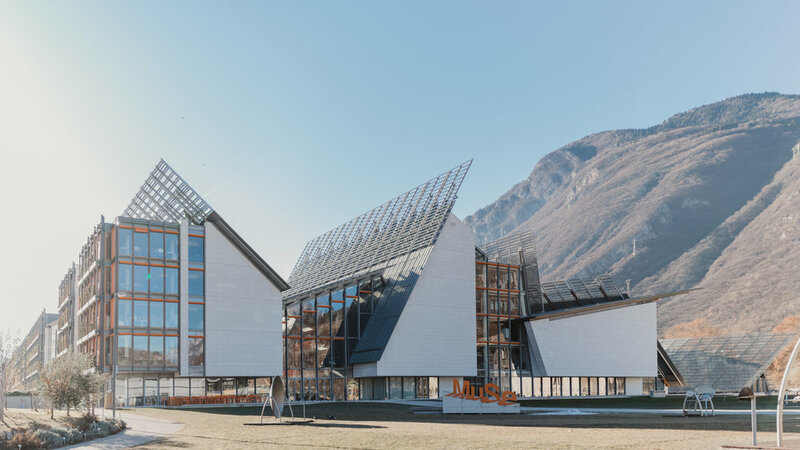 The behemoth of Trento’s science museum, MUSE, stands in contrast to the small northern Italian city. While the MUSE is assertive, strong, and high tech, Trento is placid and traditional. The MUSE is sleek, but Trento is rugged. The Piccole Dolomiti mountains loom as a juxtaposed reminder of the museum’s conspicuous design. The MUSE’s modern approach may also seem paradoxical to its function as a natural history and science museum. Inside, the levels ascend in order of the world’s biomes. Fossils and dinosaur fossils fill the basement, while taxidermy owls fly around the fifth-floor alpines. Children eagerly flip through the interactive tech exhibits. The MUSE’s appearance seems out of touch, but its architect ingenious wove function into its design. Famed Italian architect Renzo Piano designed the MUSE in 2012. Piano’s impressive portfolio includes Paris’s Centre Georges Pompidou, the Whitney Museum of American Art, and The Morgan Library and Museum in New York. Trento’s MUSE is among his lesser known works, yet it is still situated within his most iconic style: an environmentally-conscious futurism. It is within this style that Piano manages to blend the museum’s casing with its content, and pay tribute to the region in which it resides. The MUSE’s exterior is a futuristic reflection of the natural environment. The icy façade reflects its surroundings quite literally – the grass, the sculptures, the historic buildings, and cable lines. Sleek voids break the busy glass, reminiscent of grand Alpine glaciers. Its dynamic lines and angular roof create broken movement, tectonic plates sliding and shifting. The tall glass panels allow natural light to shine through, with a similar feel to modern day tech companies. Piano regards lightness as integral to his architecture saying, “I try to use immaterial elements like transparency, lightness, the vibration of the light. I believe that they are as much a part of the composition as the shapes and volumes." Piano additionally incorporated naturally-sourced minerals from the Trentino region in the MUSE’s construction: zinc, aluminum, steel, and glass, as part of his sustainability effort for the museum. He revitalized the natural geography around him, taking from what is present and upcycling. The MUSE itself is situated where an old Michelin factory once stood, dilapidated, and now is the beginning of a new urbanization project by the Renzo Piano Building Workshop. However, his energy efficient design doesn’t stop there. Piano infused green technology into the building, giving the MUSE the highest Leadership in Energy and Environmental Design rating. The roof houses photovoltaic panels, an energy plant and geothermal system to supply the museum’s energy. Green stone absorbs solar thermal energy, and rainwater is collected and harvested from the roof. The museum’s interior explores the natural landscape of the earth, informing its visitors on the beauty of the nature that surrounds us. The exhibits touch on man’s imprint on the earth –the destructive implications of human innovation – and the reason why the ecosystems around us are so fragile and valuable. But Piano ensured that the MUSE would not be another energy-sucking, nature-destroying human creation. Piano’s design grew from the Trentino region’s natural resources into a structure that embodies futuristic design and sustainability. He presents an alternative to destruction, that humans can create something that celebrates nature and act as a keeper of the resources around us.